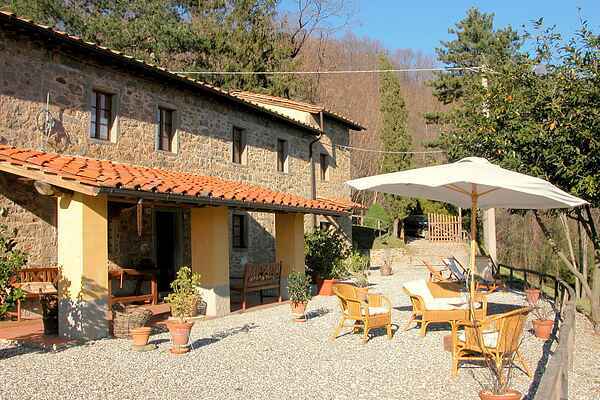 Authentic Tuscan country home situated between Pistoia and Lucca. This holiday home is the result of the skilful renovation of an old country property. The original characteristics and charm have been maintained. The structure is made up of 3 holiday residences, each different and furnished in a typically rustic style. Guests can enjoy all the peace and quiet of the Tuscan hills and a pool with garden. Nearby places of interest include: Pistoia, Lucca, Montecatini Terme; the beach (Viareggio) and Florence, which are all a little over an hour away by car. Liguria and the Cinqueterre are approximately 1.5 hours away. For 30€ you can have a massage on location! The jacuzzi is for our guests only and is on request. Fabio will help you to use it. Restaurants in the area are cheap and really typical. They are very frequented by the inhabitants of the valley, and this is an important sign of thequality of their dishes. Interesting to visit nearby: Pistoia, Lucca, Montecatini Terme; the sea (Viareggio) and Florence are just a little less than 1 hour drive. Liguria and the Cinqueterre are approximately 1.5 hours.